About this time it happened, (as can be found in the Roman Histories) that Julius Caesar, having subdued Gaul, came to the shore of the Ruteni. And when from thence he had got a prospect of the island of Britain, he inquired of those about him what country it was, and what people inhabited it. Then fixing his eyes upon the ocean, as soon as he was informed of the name of the kingdom and the people, he said: "In truth we Romans and the Britons have the same origin, since both are descended from the Trojan race. Our first father, after the destruction of Troy, was Aeneas; theirs, Brutus, whose father was Sylvius, the son of Ascanius, the son of Aeneas. But I am deceived, if they are not very much degenerated from us, and know nothing of the art of war, since they live separated by the ocean from the whole world. The may be easily forced to become our tributaries, and subjects to the Roman state. Before the Romans offer to invade or assault them, we must send them word that they pay tribute as other nations do, and submit themselves to the senate; for fear we should violate the ancient nobility of our father Priamus, by shedding the blood of our kinsmen." All of which he accordingly took care to signify in writing to Cassibellaun; who in great indignantion returned him an answer in the following letter. "Cassibellaun, king of the Britons, to Caius Julius Caesar. We cannot but wonder, Caesar, at the avarice of the Roman people, since their insatiable thirst for money cannot let us alone, though the dangers of the ocean have placed us in a manner out of the world; but they must have the presumption to covet our substance, which we have hitherto enjoyed in quiet. Neither is this indeed sufficient: we must also choose subjection and slavery to them, before the enjoyment of our native liberty. Your demand, therefore, Caesar, is scandalous, since the same vein of nobility flows from Aeneas in both Britons and Romans, and one and the same chain of consanguinity unites us: which ought to be a band of firm union and friendship. It was that, which you should have demanded of us, and not slavery: we have learned to admit of the one, but never to bear the other. And so much have we been accustomed to liberty, that we are perfectly ignorant what it is to submit to slavery. And even if the gods themselves should attempt to deprive us of our liberty, we would, to the utmost of our power, resist them in defence of it. Know then, Caesar, that we are ready to fight for that and our kingdom, if, as you threaten, you shall attempt to invade Britain." On receiving this answer, Caesar made ready his fleet, and waited for a fair wind to execute his threats against Cassibellaun. As soon as the wind stood fair, he hoisted his sails, and arrived with his army at the mouth of the river Thames. The ships were now just come close to land, when Cassibellaun with all his forces appeared on his march against them, and coming to the town of Dorobellum, he consulted with his nobility how to drive out the enemy. There was present with him Belinus, general of his army, by whose counsel the whole kingdom was governed. There were also his two nephews, Androgeus, duke of Trinovantum, and Tenuantius duke of Cornwall, together with three inferior kings, Cridious, king of Albania, Guerthaeth of Venedotia, and Britael of Dimetia, who, as they had encouraged the rest to fight the enemy, gave their advice to march directly to Caesar's camp, and drive them out of the country before they could take any city or town. For if he should possess himself of any fortified places, they said it would be more difficult to force him out, because he would then know whither to make a retreat with his men. To this proposal they all agreed, and advanced towards the shore where Julius Caesar had pitched his camp. And now both armies drew out in order of battle, and began the fight, wherein both bows and swords were employed. Immediately the wounded fell in heaps on each side, and the ground was drenched with the blood of the slain, as much as if it had been washed with the sudden return of the tide. While the armies were thus engaged, it happened that Nennius and Androgeus, with the citizens of Canterbury and Trinovantum, whom they commanded, had the fortune to meet with the troop in which Caesar himself was present. And upon an assault made, the general's cohort was very nearly routed by the Britons falling upon them in a close body. During this action, fortune gave Nennius an opportunity of encountering Caesar. Nennius therefore boldly made up to him, and was in great joy that he could but give so much as one blow to so great a man. On the other hand, Caesar being aware of his design, stretched out his shield to receive him, and with all his might struck him upon the helmet with his drawn sword, which he lifted up again with an intention to finish his first blow, and make it mortal; but Nennius carefully prevented him with his shield, upon which Caesar's sword glancing with great force from the helmet, became so firmly fastened therein, that when by the intervention of the troops they could no longer continue the encounter, the general was not able to draw it out again. Nennius, thus becoming master of Caesar's sword, threw away his own, and pulling the other out, made haste to employ it against the enemy. Whomsoever he struck with hit, he either cut off his head, or left him wounded without hopes of recovery. While he was thus exerting himself, he was met with Labienus, a tribune, whom he killed in the very beginning of the encounter. At last, after the greatest part of the day was spent the Britons poured in so fast, and made such vigorous efforts, that by the blessing of God they obtained the victory, and Caesar, with his broken forces, retired to his camp and fleet. The very same night, as soon as he had got his men together again, he went on board his fleet, rejoicing that he had the sea for his camp. And upon his companions dissuading him from continuing the war any longer, he acquiesced in their advice, and returned back to Gaul. Cassibellaun, in joy for this triumph, returned solemn thanks to God; and calling the companions of his victory together, amply rewarded every one of them, according as they had distinguished themselves. On the other hand, he was very much oppressed with grief for his brother Nennius, who lay mortally wounded, and at the very point of death. For Caesar had wounded him in the encounter, and the blow which he had given him proved incurable; so that fifteen days after the battle he died, and was buried at Trinovantum, by the North Gate. His funeral obsequies were performed with regal pomp, and Caesar's sword put into the tomb with him, which he had kept possession of, when struck into his shield in the combat. The name of the sword was Crocea Mors (Yellow Death), as being mortal to every body that was wounded with it. After this flight of Caesar, and his arrival on the Gallic coast, the Gauls attempted to rebel and throw off his yoke. For they thought he was so much weakened, that his forces could be no longer a terror to them. Besides, a general report was spread among them, that Cassibellaun was now out at sea with a vast fleet to pursue him in his flight; on which account the Gauls, growing still more bold, began to think of driving him from their coasts. Caesar, aware of their designs, was not willing to engage in a doubtful war with a fierce people, but rather chose to go to all their first nobility with open treasures, and reconcile them with presents. To the common people he promised liberty, and the dispossessed the restitution of their estates, and to the slaves their freedom. Thus he that had insulted them before with the fierceness of a lion, and plundered them of all, now, with the mildness of a lamb, fawns on them with submissive abject speeches, and is glad to restore all again. To these acts of meanness he was forced to condescend till he had pacified them, and was able to regain his lost power. In the meantime not a day passed without reflecting upon his flight, and the victory of the Britons. After two years were expired, he prepared to cross the sea again, and revenge himself on Cassibellaun, who having intelligence of his design, everywhere fortified his cities, repaired the ruined walls, and placed armed men at all the ports. In the river Thames, on which Caesar intended to sail up to Trinovantum, he caused iron and leaden stakes, each as thick as a man's thigh, to be fixed under the surface of the water that Caesar's ships might founder. He then assembled all the forces of the island, and took up his quarters with them near the sea-coasts, in expectation of the enemy's coming. After he had furnished himself with all necessities, the Roman general embarked with a vast army, eager to revenge himself on a people that had defeated him; in which he undoubtedly would have succeeded, if he could but have brought his fleet safe to land; but this he was not able to do. For in sailing up the Thames to Trinovantum, the ships struck against the stakes, which so endangered them all on a sudden, that many thousands of men were drowned, while the ships being pierced sank into the river. Caesar, upon this, employed all his force to shirt his sails, and hastened to get back again to land. And so those that remained, after a narrow escape, went on shore with him. Cassibellaun, who was present on the bank, with joy observed the disaster of the drowned, but grieved at the escape of the rest; and upon his giving a signal to his men, made an attack upon the Romans, who, nothwithstanding the danger they had suffered in the river, when landed, bravely withstood the Britons; and having no other fence to trust but their own courage, they made no small slaughter; but yet suffered a greater loss themselves, than that which they were able to give the enemy. For their number was considerably diminished by their loss in the river; whereas the Britons being hourly increased with new recruits, were three times their number, and by that advantage defeated them. Caesar, seeing he could no longer maintain his ground, fled with a small body of men to his ships, and made the sea his safe retreat; and as the wind stood fair, he hoisted his sails, and steered to the shore of the Morini. From thence he repaired to a certain tower, which he had built at a place called Odnea, before this second expedition into Britain. For he durst not trust the fickleness of the Gauls, who he feared would fall upon him a second time, as we have said already they did before, after the first flight he was forced to make before the Britons. And on that account he had built this tower for a refuge to himself, that he might be able to maintain his ground against a rebellious people if they should make insurrection against him. "Androgeus, duke of Trinovantum, to Caius Julius Caesar, instead of wishing death as formerly, now wishes health. I repent that ever I acted against you, when you made war against the king. Had I never been guilty of such exploits, you would have vanquished Cassibellaun, who is so swollen with pride since his victory, that he is endeavouring to drive me out of his coasts, who procured him that triumph. Is this a fit reward for my services? I have settled him in an inheritance; and he endeavours to disinherit me. I have a second time restored him to the kingdom and he endeavours to destroy me. All this have I done for him in fighting against you. I call the gods to witness I have not deserved his anger, unless I can be said to deserve it for refusing to deliver up my nephew, whom he would have condemned to die unjustly. Of which, that you may be better able to judge, hear this acount of the matter. It happened that for joy of the victory we performed solemn honours to our tutelary gods, in which after we had finished our sacrifices, our youth began to divert themselves with sports. Among the rest our two nephews, encouraged by the example of the others, entered the lists: and when mine had got th better, the other without any cause was incensed, and just going to strike him; but he avoided the blow, and taking him by the hand that held the sword, strove to wrest it from him. In this struggle the king's nephew heppened to fall upon the sword's point, and died upon the spot. When the king was informed of it, he commanded me to deliver up the youth, that he might be punished for murder. I refused to do it; whereupon he invaded my provinces with all his forces, and has given me very great disturbance; flying, therefore, to your clemency, I desire your assistance, that by you I may be restored to my dignity, and by me you may gain possession of Britain. Let no dounts or suspicion of treachery in this matter detain you. Be influenced by the common motive of mankind; let past enmities beget a desire of friendship and after defeat make you more eager for victory." Dreaded their force, and fled the hostile ground. Two days were now passed, when Cassibellaun having consumed all his provision, feared famine would oblige him to surrender himself prisoner to Caesar. For this reason he sent a message to Androgeus to make his peace with Julius, lest the honour of the nation might suffer by his being taken prisoner. He likewise represented that he did not deserve to be pursued to death for the annoyance he ahd given him. As soon as the messengers had told this to Androgeus, he made answer: "That prince deserves not to be loved, who in war is mild as a lamb, but in peace cruel as a lion. Ye gods of heaven and earth! Does my lord then condescend to entreat me now, whom before he took upon him to command? Does he desire to be reconsiled and make his submission to Caesar, of whom Caesar himself, had before desired peace? He ought therefore to have considered, that he who was able to drive so great a commander out of the kingdom, was able also to bring him back again. I ought not to have been so unjustly treated, who had then done him so much service, as well as now so much injury. He must be mad who either injures or reproaches his fellow soldiers by whom he defeats the enemy. The victory is not the commander's, but theirs who lose their blood in fighting for him. However, I will procure him peace if I can, for the injury which he has done me is sufficiently revenged upon him, since he sues for mercy to me." Androgeus after this went to Caesar, and after a respectful salutation addressed him in this manner: "You have sufficiently revenged yourself upon Cassibellaun; and now let clemency take the place of vengeance. What more is there to be done than that he make his submission and pay tribute to the Roman state?" To this Caesar returned him no answer: upon which Androgeus said again; "My whole engagement with you, Caesar, was only to reduce Britain under your power, by the submission of Cassibellaun. Behold! Cassibellaun is now vanquished and Britain by my assitance become subject to you. What further service do I owe you? God forbid that I should suffer my sovereign who sues to me for peace, and makes me satisfaction for the injury which he has done me, to be in prison or in chains. It is no easy matter to put Cassibellaun to death while I have life; and if you do not comply with my demand, I shall not be ashamed to give him my assistance." Caesar, alarmed at these menaces of Androgeus, was forced to comply, on conditon that he should pay a yearly tribute of three thousand pounds of silver. So then Julius and Cassibellaun from this time became friends, and made presents to each other. After this, Caesar wintered in Britain, and the following spring returned into Gaul. At length he assembled all his forces, and marched towards Rome against Pompey. After seven years had expired, Cassibellaun died and was buried at York. He was succeeded by Tenuantius, duke of Cornwall, and brother of Androgeus: for Androgeus was gone to Rome with Caesar. Tenuantius therefore, now wearing the crown, governed the kingdom with diligence. He was a warlike man, and a strict observer of justice. After him Kymbelinus his son was advanced to the throne, being a great soldier, and brought up by Augustus Caesar. He had contracted so great a friendship with the Romans, that he freely paid them tribute when he might have very well refused it. In his days was born our Lord Jesus Christ, by whose precious blood mankind was redeemed from the devil, under whom they had been before enslaved. Kymbelinus, when he had governed Britain ten years, begat two sons, the elder named Guiderius, the other Arviragus. After his death the government fell to Guiderius. 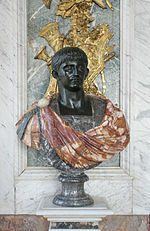 This prince refused to pay tribute to the Romans; for which reason Claudius, who was now emperor, marched against him. He was attended in this expedition by the commander of his army, who was called in the British tongue, Leuis Hamo, by whose advice the following war was to be carried on. This man, therefore, arriving at the city of Portcestre, began to block up the gates with a wall, and denied the citizens all liberty of passing out. For his design was either to reduce them to subjection by famine, or kill them without mercy. Guiderius, upon the news of Claudius's coming, assembled all the soldiery of the kingdom, and went to meet the Roman army. In the battle that ensued, he began the assault with great eagerness, and did more execution with his own sword than the greater part of his army. Claudius was now on the point of retreating to his ships, and the Romans very nearly routed, when the crafty Hamo, throwing aside his own armour, put on that of the Britons, and as a Briton fought against his own men. Then he exhorted the Britons to a vigourous assault, promising them a speedy victory. For he had learned their language and manners, having been educated among the British hostages at Rome. By these means he approached by little and little to the king, and seizing a favourable opportunity, stabbed him while under no apprehension of danger, and then escaped through the enemy's ranks to return to his men with the news of his detestable exploit. But Arviragus, his brother, seeing him killed, forthwith put on his brother's habiliments, and, as if he had been Guiderius himself, encouraged the Britons to stand their ground. Accordingly, as they knew nothing of the king's disaster they made a vigorous resistance, fought courageously, and killed no small number of the enemy. At last the Romans gave ground, and dividing themselves into two bodies, basely quitted the field. Caesar with one part, to secure himself, retired to his ships; but Hamo fled to the woods, because he had not time to get to his ships. Arviragus, therefore, thinking that Claudius fled along with him, pursued him with all speed, and did not leave off harassing him from place to place, till he overtook him on a part of the sea-coast, which, from the name of Hamo, is now called Southampton. There was at the same place a convenient haven for ships, and some merchant ships at anchor. And just as Hamo was attempting to get on board them Arviragus came upon him unawares, and forthwith killed him. And ever since that time the haven has been called Hamo's port. In the meantime, Claudius, with his remaining forces, assaulted the city above mentioned, which was then called Kaerperis, now Portcestre, and presently levelled the walls, and having reduced the citizens to subjection, went after Arviragus, who had entered Winchester. Afterwards he besieged that city, and employed a variety of engines against it. Arviragus, seeing himself in these straits, called his troops together, and opened the gates, to march out and give him battle. But just as he was ready to begin the attack, Claudius, who feared the boldness of the king, and the bravery of the Britons, sent a message to him with a proposal of peace; choosing rather to reduce them by wisdom and policy, than run the hazard of a battle. To this purpose he offered a reconciliation with him, and promised to give him his daughter, if he would only acknowledge the kingdom of Britain subject to the Roman state. The nobility hereupon persuaded him to lay aside thoughts of war, and be content with Claudius's promise; representing to him at the same time, that it was no disgrace to be subject to the Romans, who enjoyed the empire of the whole world. By these and many other arguments he was prevailed upon to hearken to their advice, and make his submission to Caesar. After which Claudius sent to Rome for his daughter, and then, with the assistance of Arviragus, reduced the Orkneys and the provincial islands to his power. As soon as the winter was over, those that were sent for Claudius's daughter returned with her, and presented her to her father. The damsel's name was Genuissa, and so great was her beauty, that it raised the admiration of all that saw her. After her marriage with the king, she gained so great an ascendant over his affections, that he in a manner valued nothing but her alone: insomuch that he was desirous to have the place honoured where the nuptials were solemnized and moved Claudius to build a city upon it, for a monument to posterity of so great and happy a marriage. Claudius consented to it, and commanded a city to be built, which after his name is called Kaerglou, that is Gloucester, to this day, and is situated on the confines of Dimetia and Loegria, upon the banks of the Severn. But some say that it derived its name from Duke Gloius, a son that was born to Claudius there, and to whom, after the death of Arviragus, fell the dukedom of Dimetia. The city being finished, and the island now enjoying peace, Claudius returned to Rome, leaving to Arviragus the government of the British islands. At the same time the apostle Peter founded the Church of Antioch; and afterwards coming to Rome, was bishop there, and sent Mark, the evangelist, into Egypt to preach the gospel which he had written. Or thee his lord some captive king shall call." In war none was more fierce than he, in peace none more mild, none more pleasing, or in his presents more magnificent. When he had finished his course of life, he was buried at Gloucester, in a certain temple which he had built and dedicated to the honour of Claudius. His son Marius, a man of admirable prudence and wisdom, succeeded him in the kingdom. In his reign a certain king of the Picts, named Rodric, came from Scythia with a great fleet, and arrived in the north part of Britain, which is called Albania, and began to ravage that country. Marius therefore raising an army went in quest of him, and killed him in battle, and gained the victory; for a monument of which he set up a stone in the province, which from his name was afterwards called Westmorland after him, where there is an inscription retaining his memory to this day. He gave the conquered people that came with Rodric liberty to inhabit that part of Albania which is called Caithness, that had been a long time desert and uncultivated. And as they had no wives, they desired to have the daughters and kinswomen of the Britons. But the Britons refused, disdaining to unite with such a people. Having suffered a repulse here, they sailed over into Ireland, and married the women of that country and by their offspring increased in number. But let thus much suffice concerning them, since I do not propose to write the history of this people, or of the Scots, who derived their original from them and the Irish. Marius, after he had settled the island in perfect peace, began to love the Roman people, paying the tribute that was demanded of him; and in imitation of his father's example practised justice, law, peace, and every thing that was honourable in his kingdom. As soon as he had ended his days, his son Coillus took upon him the government of the kingdom. He had been brought up from his infancy at Rome, and having been taught the Roman manners, had contracted a most strict amity with them. He likewise paid them tribute, and declined making them any opposition, because he saw the whole world subject to them, and that no town or country was out of the limits of their power. By paying therefore what was required of him, he enjoyed his kingdom in peace: and no king ever showed greater respect to his nobility, not only permitting them to enjoy their own with quiet, but also binding them to him by his continual bounty and munificence. Coillus had but one son, named Lucius, who, obtaining the crown after his father's decease, imitated all his acts of goodness, and seemed to his people to be no other than Coillus himself revived. As he had made so good a beginning, he was willing to make a better end: for which purpose he sent letters to Pope Eleutherius, desiring to be instructed by him in the Christian religion. For the miracles which Christ's disciples performed in several nations wrought a conviction in his mind; so that being inflamed with an ardent love of the true faith, he obtained the accomplishment of his pious request. For that holy pope, upon receipt of this devout petition, sent to him two most religious doctors, Faganus and Duvanus, who, after they had preached concerning the incarnation of the Word of God, administered baptism to him, and made him a proselyte to the Christian faith. Immediately upon this, people from all countries, assembling together, followed the king's example, and being washed in the same holy laver, were made partakers of the kingdom of heaven. The holy doctors, after they had almost extinguished paganism over the whole island, dedicated the temples, that had been founded in honour of many gods, to the only God and his saints, and filled them with congegations of Christians. There were then in Britain eight and twenty flamens, as also three archflamens, to whose jurisdiction the other judges and enthusiasts were subject. These also, according to the apostolic command, they delivered from idolatry, and where they were flamens made them bishops, where archflamens archbishops. The seats of the archflamens were at the three noblest cities, viz. London, York, and the City of Legions, which its old walls and buildings show to have been situated upon the river Uske in Glamorganshire. To these three, now purified from superstition, were made subject twenty-eight bishops, with their dioceses. To the metropolitan of York were subject Deira and Albania, which the great river Humber divides from Loegria. To the metropolitan of London were subject Loegria and Cornwall. These two provinces the Severn divides from Kambria or Wales, which was subject to the City of Legions. At last, when they had made an entire reformation here, the two prelates returned to Rome, and desired the pope to confirm what they had done. As soon as they had obtained a confirmation, they returned again to Britain, accompanied with many others, by whose doctrine the British nation was in a short time strengthened in the faith. Their names and acts are recorded in a book with Gildas wrote concerning the victory of Aurelius Ambrosius; and what is delivered in so bright a treatise, needs not to be repeated here in a meaner style. ↑ Primarily, Caesar's own Commentaries on the Gallic War Books 4 and 5; also Cicero, Letters to friends 7.6, 7.7, 7.8, 7.10, 7.17, Letters to his brother Quintus 2.13, 2.15, 3.1, Letters to Atticus 4.15, 4.17, 4.18; Dio Cassius, Roman History 39.50-53, 40.1-3; Suetonius, Julius 25, 47; Velleius Paterculus, Roman History 2.46-47; Appian, Epitome of Gallic History 5, Civil Wars 2.150; Plutarch, Caesar 16.5, 23.2; Florus, Epitome of Roman History 1.45; Eutropius, Abridgement of Roman History 6.17; Livy, Perochiae 105.5; Orosius, Histories Against the Pagans 6.9. Medieval texts Geoffrey probably had access to include Bede, Ecclesiastical History of the English People 1.2, which reproduces Orosius almost verbatim, and the Historia Brittonum 19-20. Caesar invaded Britain twice, in 55 and 54 BC. ↑ probably Canterbury, which was known as Durovernum in Roman times. Welsh: Doral (Cooper). ↑ Welsh Trahayant, elsewhere Tenefan (Cooper). ↑ Thorpe: Gueithaet; Welsh: Gwerthaet (Cooper). ↑ Welsh: Alibiens iarll ("Alibiens the earl", Jesus College MS LXI). The tribune who was killed in Britain was Quintus Laberius Durus (Caesar, Commentaries on the Gallic War 5.15); Titus Labienus was Caesar's legate in Gaul. The confusion of the two names can be traced to Orosius's Histories Against the Pagans. ↑ Welsh: Angau Coch ("Red Death", Jesus College MS LXI), Agheu Glas ("Grey Death", Brut Dingestow). ↑ The Britons fortified the Thames with sharp stakes in a vain effort to prevent footsoldiers from fording the river, not to damage ships sailing up it (Caesar, Commentaries on the Gallic War 5.18). ↑ Thorpe: Cuelinus; Welsh: Kyhylyn (Cooper). ↑ Lucan, Pharsalia 5.572. More literally, "Terrified, he showed his back to the Britons he had sought". ↑ Caesar's civil war against Pompey began in 49 BC. ↑ Welsh: Kynvelyn (Cooper), the historical Cunobelinus. ↑ Sources for Claudius's invasion of AD 43 are: the Arch of Claudius; Tacitus, Agricola 13-14; Dio Cassius, Roman History 60:19-22; Suetonius, Claudius 17, 21.6, 24.3, 28, Vespasian 4; Josephus, The War of the Jews 3.1.2; Eutropius, Abridgement of Roman History 7:13; Orosius, Histories Against the Pagans 7.6. See also Bede, Ecclesiastical History of the English People 1.3; Historia Brittonum 21. ↑ Thorpe: Lelius Hamo; Welsh: Hamon (Cooper). ↑ Welsh: Porth Hamon, Porth Hamwnt (Cooper). ↑ In fact, Vespasian was part of the invasion of AD 43 - see note to Chapter 12. ↑ Juvenal, Satires 4.126-127. Literally, "You will seize some king, or from the British (chariot-)pole/Arviragus will fall". The prophesy is addressed to the emperor Domitian (r. AD 81-96). ↑ r. ca. 174-189. Welsh: Elenteriws (Cooper). ↑ Welsh: Dyfan and Ffagan (Cooper). ↑ Gildas (The Ruin of Britain 8-12) briefly deals with the conversion of Britain to Christianity, but in no more detail than Geoffrey. This page was last edited on 17 June 2018, at 14:42.